Characterized by its cotton ball-like appearance, the Bichon Frise is a small dog breed full of wonderful contradictions that come together to make a sweet and loyal dog. The breed usually weighs from ten to twenty pounds, and it stands nine to twelve inches tall. Their eyes and nose are black, which stand out prettily on their white coat. Their tail is plumed, which they carry curled over their back, which is beautiful in motion when wagged. The Bichon Frise’s very name describes it in French as “curly-coated.” Their head, body, and limbs are covered in curly white fur that rounds out any harsh edges or sharp lines on their silhouette. They are similar in both coloring and temperament to their cousin the Maltese. Like their cousin, the Bichon Frise originated somewhere along the Mediterranean as a sailor’s dog and probably moved from Spain into France, where their popularity skyrocketed. During the Renaissance, the Bichon Frise played in the royal courts of Francis I and Henry III of France, where they cemented their identity as a companion dog. They spread throughout the globe, becoming especially favored in Australia. Their popularity continued well into modern times. Although their coat is lush and beautiful, its reluctance to shed dander makes it a possible fit for someone with light allergies. However, since its coat does still shed some dander, a trial period may be necessary to see if this dog is a good fit for your home with people with dander allergies, just the same as they would need before welcoming any dog into their home. Although their coat doesn’t shed often, it requires regular grooming. This includes brushing and combing a few times each week to every day, as well as trimming and clipping their coat every six weeks. Grooming prevents matting and the formation of hematomas. The Bichon Frise has a long lifespan at twelve to thirteen years. However, they are susceptible to many health issues. Some complications come from their habits of scratching and chewing on themselves, which can manifest as serious skin conditions. Their skin is also sensitive to outside factors: they are very allergic to fleas, chemicals, pollen, and other common irritants. Other complications that this breed may have include heart problems, liver shunts, ear infections, patellar luxation, cataracts, and diabetes. They may also be affected by autoimmune hemolytic anemia and immune-mediated thrombocytopenia, and owners considering this breed should discuss what this means with a trusted veterinarian. To prevent excess weight gain and other health complications, the Bichon Frise must be exercised lightly but regularly. They respond well to positive training, and adore learning tricks to impress their family. 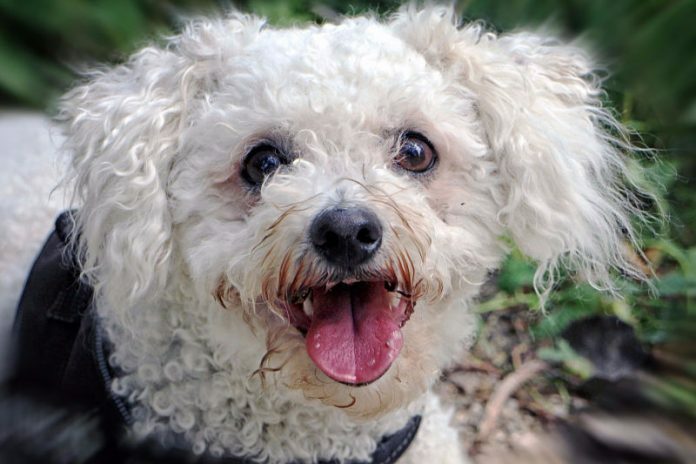 This dog enjoys walks as well as playtime in a fenced yard, where you can see your very own “Bichon Blitz” as your dog zooms around the space. After a run around the yard, your Bichon Frise will be ready for a cuddle on the couch. This breed is somewhat known for their separation anxiety, and therefore should not be forced to sleep outside or stay at home alone for a long period of time. If left alone for too long, they may become destructive and unlearn some obedience training if they feel they are being abandoned. This may also make them prone to barking. Additionally, they do not like being outside in the rain and would do best with a covered part of their yard or place to use the restroom. As long as their family is often with them, they will be able to adapt to many kinds of lifestyles. However, as they are fragile, they may not do well with young children who may play with them too roughly. They are a gentle, happy breed, making them perfect for aging seniors or even as therapy dogs to be brought to hospitals. Although they are eager to learn, they are one of the more difficult breeds to house train. However, after proper training, they are a merry and sweet breed which will bring you years of happy companionship.